People who have dark skin tend to also have coarse, curly hair. This type of hair forms thick beards that are often difficult to deal with. What is worse, attempting to shave this type of facial hair without the right tools will often lead to problems such as razor bumps, irritation and other lesions. In order to help you avoid these problems, the present guide will go over ten of the best electric shavers for black men. Furthermore, it will provide important information that will help you choose the best electric shaver for you. What is the Difference Between Shaving African-American Skin and Shaving Caucasian Skin? How to Choose the Best Electric Shaver for Black Skin? What are the Advantages and Benefits of This Type of Product? Some dark-skinned men have very thick and coarse facial hair. So much so, that regularly-powered electric shavers tend to be ineffective in cutting it. Apart from making the process more difficult and the result less satisfactory, this ineffective cutting can result in irritation and razor bumps. Luckily, the Braun Electric Shaver 9290cc offers a great amount of power that, combined with the efficiency of its design, results in a smooth, close shave no matter how thick your hair is. In addition to being powerful, this shaver’s motor is smart. Using its AutoSensing technology, it provides extra efficiency when shaving thick beards. Apart from featuring a truly impressive little motor and extra-sharp titanium blades, this electric shaver is able to reach a great level of power due to Braun’s proprietary SyncroSonicTM technology. Capable of producing up to 10,000 micro-vibrations, this technology makes it possible for you to remove all the hair in an area with a single stroke. Quite impressively, this electric shaver features five synchronized shaving elements. Working together, these elements are able to effectively capture more hair in every stroke. At the same time, these five elements ensure a more thorough shaving action, resulting in a dramatic reduction in the number of hairs that end up becoming ingrown. What is more, the shaver does this without plucking the hair at any point, making the shaving process smoother and reducing the level of irritation that results from it. Produces up to 10,000 micro-vibrations. There are some black men that do not have thick hair. However, their facial hair may still be curly and somewhat coarse. If this is your case, you may not need an electric shaver that is too powerful. However, it still needs to adapt itself to your type of hair, providing a close shave that simultaneously unburies and clips potential ingrown hairs. Introducing the Phisco Electric Shaver Razor for Men, a reliable product that, despite not being too powerful or expensive, works with any type of hair. In order to provide an efficient and quick shave, the Phisco Electric Shaver Razor for Men uses three precision shaving heads. Each of these heads has a double-track ultra thin spherical cutter net. This element, in combination with the shaver’s self-sharpening steel blades, results in a clean, close shave that does not hurt sensitive skin. At the same time, this ergonomic shaving action is able to cut unruly hairs at just the right altitude, even when they have already begun to turn around and grow inward. In addition to its main features, the Phisco Electric Shaver Razor has a few additional characteristics that make it even more alluring. Among them, LED indicators and a pop-up trimmer stand out. The shaver, however, only has one shaving mode, and it does not include accessories for specific shaving modalities. However, it is an affordable and reliable electric shaver that does the job right no matter the type of skin it is used on. Compact and lightweight, this rotary electric shaver can be a life-saver for men who are constantly on-the-go. Battery-operated, it is also remarkably practical for travelers. In fact, it provides up to 60 minutes of continuous, vigorous shaving despite the topography of your skin. Unlike most portable electric shavers, the Philips Norelco PQ208/40 provides a fairly close shave. Due to the shaver’s independently-floating dual heads, this is even a reality in tough spots that are difficult to reach. Both heads can change their position to adapt themselves to the shape of your face, resulting in a much easier and efficient shave. The Philips Norelco PQ208/40 helps you get a close shave by incorporating an incredible self-sharpening system for its blades. This, in combination with the shaver’s ergonomic design and powerful motor, results in a close shave that does not hurt the skin or enables ingrown hairs from appearing. Combining the benefits of a trimmer and a shaver into one practical product, the Phillips Norelco OneBlade is a versatile piece of design. Shaped a lot like a classic manual shaver, this electric device feels right at home. However, powered by a vigorous little motor, its performance is truly superior. Given its reduced dimensions and classic design, the Phillips Norelco OneBlade is very portable. As a result, it is particularly handy for traveling or as an emergency tool for on-the-go touchups. What is more, its blade is easily replaceable, making this a truly practical product. Despite the simplicity of its design, this electric shaver is very versatile. Just as easily, it allows you to trim down, edge up or directly shave off your beard. This is only helped by the shaver’s mobile head, a feature that helps the blade follow the contour of your face and neck. Without a doubt, the most helpful feature that this shaver has for black men is its ability to be used either wet, with shaving cream or dry. This will help dark-skinned users take into account their particular situation and shave in the manner that is most comfortable for them. As a bonus, no matter the way you use it, the OneBlade can be easily cleaned. Those who like the performance of Phillips Norelco shaving products but do not like to shave too close or too often would be well-advised to check this model out. Featuring the company’s proprietary DualPrecision system, the Shaver 4500 AT830/46 is able to shave both long hair and short stubble. In order to provide a perfectly even shave that is still close and satisfying, this electric shaver uses the Pivot, Flex and Float system. As a result, its heads are constantly in contact with the skin, even in difficult areas. This fantastic feature makes the Philips Norelco Shaver 4500 AT830/46 perfect for maintaining a stubbly beard without looking disheveled. Going a bit deeper, it can be said that what makes this electric shaver a great option for people with a tendency to get ingrown hairs is its patented Super Lift and Cut Dual-blade action. This system makes it possible for the shaver to lift all hair straight before cutting them, preventing them from burying themselves back into the skin. Shaves hair of various lengths. Features a useful pop-up trimmer. Super Lift and Cut Dual-blade technologies prevent ingrown hairs. Pop-up trimmer tends to get stuck. If you are a busy man who is always on the go, this MAX-T electric shaver may be the perfect companion for you. Without a doubt, its straightforward design and easy use help make this a reality. However, the big seller, in this case, is the shaver’s incredibly efficient 1-minute USB charging. In that short period of time, the shaver can get enough charge to power one shave. With 1 full hour, it can provide 120 minutes (approximately two months) of use. While its shaving area is rather wide and covering, the MAX-T Electric Shaver USB Quick Charge Rotary Shaver has a slim, ergonomic grip, reducing its fame and making it more portable. Adding to its usability, this electric shaver is fully waterproof, allowing you to take it to the shower and, of course, use it on wet hair. Furthermore, once its top has been opened, it can be washed with water in a matter of seconds without putting the motor at risk. Apart from being practical, the MAX-T Electric Shaver USB Quick Charge Rotary Shaver is effective shaving beards of different sizes. Its 4-direction flex heads make sure it adapts to the contour of your face, resulting in an even shave. At the same time, they ensure that all your individual hairs are standing up straight before they are cut, resulting in an even shave that does not hurt your skin or enable the proliferation of razor bumps. People who shave often know the importance of reliability when it comes to electric shavers. For that reason, shavers with multiple adjustable heads often get a bad rep. Having more than one head with different parts increases the chances of malfunctions and other problems. Remington’s answer to this is the F5-5800, a shaver with a classic foil system that is as straightforward as it is reliable. 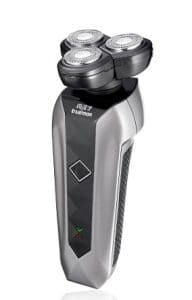 The Remington F5-5800 Foil Shaver can be used corded or cordless. When used cordless, it allows for up to 60 minutes of shaving action with a full charge. However, if your Remington F5-5800 Foil Shaver is out of power and you are in a hurry, a quick 5-minute charge can give you enough power for one shave. Of course, when the shaver is corded and plugged, you do not need to worry about the charge at all. The ability to function both corded and cordless makes the F5-5800 great for being used domestically and on-the-go. In addition to its basic functions, the F5-5800 Foil Shaver features an innovative new technology by the name of Intercept Shaving. To provide a closer shave, this mechanism pre-trims longer hairs, getting them ready for the blade to cut them cleanly and without leaving room for mistakes that could result in irritation or razor bumps. Meanwhile, the razor’s motor provides enough power to cut through the thickest beard, making this product a great option for men with thick, unruly beards. Intercept Shaving technology allows a closer, cleaner shave. More compact than most of its kind, the Panasonic ES3831K is perfect for being used during travel. However, it is reliable and efficient enough to be used at home as well. Meanwhile, its 8,500 RPM motor provides enough power to take care of beards of any type and thickness. Using an inner blade that is set at a 78-degree angle, this electric shaver is able to cut facial hairs as close as possible to the skin without producing irritation or enabling hairs to turn around and start growing inward. At the same time, due to its precision single-blade system, the Panasonic ES3831K Electric Travel Shaver is able to reach even the most difficult spots with incredible ease. As a result, shaving with this device is remarkably comfortable, even if you are inexperienced with electric shavers. Another aspect of this electric shaver that makes it great for traveling is its easy washing feature. Fully immersible in water, this shaver can be thoroughly cleaned using warm water and a bit of detergent. However, this will not be necessary if you simply rinse it after each use. To this end, the product includes a useful cleaning brush that helps you get rid of every single piece of hair with ease. Described as a smart shaver, the Series 7 790cc may provide the best solution for men with difficult beards. This incredible device has the ability to “read” and understand your beard in order to adapt itself to it. Employing four synchronized shaving elements, this shaver can adapt itself to the shape of your face with incredible ease. As a result, it’s able to remove larger amounts of hair in a single stroke. The result is a quicker and smoother shave without irritation. What’s more, this shaver’s ActiveLift technology captures and straightens flat-lying hairs, preventing harm to your skin. In order to further adapt itself to your particular needs, the Braun Electric Shaver Series 7 790cc features five different modes. These modes include different speeds, a special mode for sensitive skin and even a turbo mode for getting rid of thick beards. These modes can be toggled easily with the push or a single button. Straightens flat-lying hairs before cutting them. Men who have black skin tend to have coarser, thicker hairs. For that reason, it’s important that they use a sharp razor to shave their face. However, if performed in the wrong direction, even the sharpest shave can cause irritation and other lesions. With that in mind, the Hatteker Electric Shaver provides self-sharpening blades and a triple-head system simultaneously. Due to its waterproof seal, the Hatteker Electric Shaver can be used in both wet and dry hair. What is more, it can be used without any kind of gel or shaving cream. The truth is that, due to the smoothness and efficiency of its shave, you will not need any kind of product. While it does not have all the bells and whistles other electric shavers boast, this device does its job remarkably well. Reliable, durable and affordable, the Hatteker Electric Shaver may provide the most value out of all the products on this list. Essentially, the difference between shaving African-American skin and shaving caucasian skin is that the former is more sensitive and, thus, more prone to razor bumps and burn. 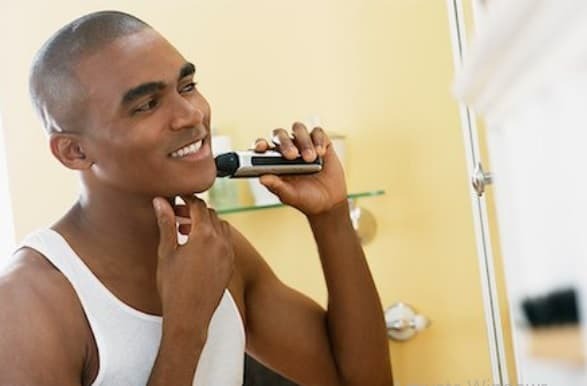 While the skin of both Caucasian and African-American men can get irritated and damaged by shaving, black individuals comprise the great majority of those who experience negative side-effects after shaving. The main reason for this is that black men tend to have coarse and curly hair. Unfortunately, this type of hair is especially susceptible to looping in and growing inward, resulting in the formation of ingrown hairs. At the same time, black skin, particularly in the facial area, has a tendency to become irritated with ease. To make things worse, the process of cutting a hair close to the skin makes it possible for said hair to turn around and begin grown back into the skin. The combination of these factors makes it very likely that black men will suffer from razor bumps and irritation. There are certain characteristics that make an electric shaver more well-suited for people with black skin. First of all, the device should be able to function for both dry and wet shaving. At the same time, the device should have a fast motor that helps you get through thick beard hair. Of course, sharp, durable blades are a must. To reach difficult spots, the shaver should be ergonomic and capable of adapting to the shape of your face. Finally, it should be able to lift flat-lying hairs in order to cut them straight. Buying a good electric shaver can be expensive. However, for a lot of men, it is an important and necessary investment. The benefits of using a high-quality electric shaver are not limited to aesthetic reasons. In fact, using a good electric shaver will prevent discomfort and pain caused by a harsh shave. More so, it can prevent the formation of razor bumps and ingrown hairs that could give way to infection and even scarring. Turn the shaver off and unplug it. If it uses batteries, remove them. Take out the cutter head. Typically, this is done by pressing a button and lifting it off the support. However, you should check the instructions manual of your shaver before attempting to do this. Using a small brush, loosen the hairs that have accumulated both outside and inside the cutter head. Many electric shavers include a brush that you can use to this end. Be gentle and do not try to remove stuck hairs by tapping the head as this could damage the blades. Use the brush on the rest of the electric shaver. Dismantle the rest of the electric shaver. In a cup, mix a bit of hot water and a squeeze of liquid detergent. Using this mix in combination with a brush, clean all the individual parts of the shaver. You could also use a special cleaning fluid for electronic devices. After cleaning them, rinse all the individual parts of the electric shaver in clean, hot water. Dry each part separately using an absorbent cloth or towel. Take a hot shower before every shave to open your pores. Trim your beard as much as possible before shaving it. Apply a face moisturizer before and after every shave. Cleanse your face every evening using a product that matches your type of skin. All the products featured in this guide were carefully selected due to their superior performance when it comes to shaving black skin. Taking everything into consideration, however, it can be stated that the Braun Electric Shaver Series 9 9290cc is the best product on this list in terms of quality, durability and performance. Meanwhile, due to its affordability, the Phisco Electric Shaver Razor for Men has earned the title of best value electric razor on the market.